Earlier in the week I posted a photo, on Facebook, of the pizza I made using my Focaccia bread recipe as the crust. This generated so many comments, and a few questions, that I thought I would compile all the components into one easy post. Tomato Sauce – I like to use the same sauce I use for a spaghetti squash or zucchini lasagne. If you like a plainer sauce for pizza you could leave out the onion and garlic. Cook the focaccia ahead of time according the recipe directions. Prepare the sauce according to recipe directions – you can keep in the refrigerator for about 2 days before you are ready to use it. This looks amazing! My name is Cindy and I blog over at Vegetarianmamma.com I wanted to invite you to link up your recipe and any others at our Gluten Free Fridays Recipe Link up party! It happens every Friday and we’d love to have you join us with some of your awesome recipes! It doesn’t mean that you have to be a gluten free bloggers. 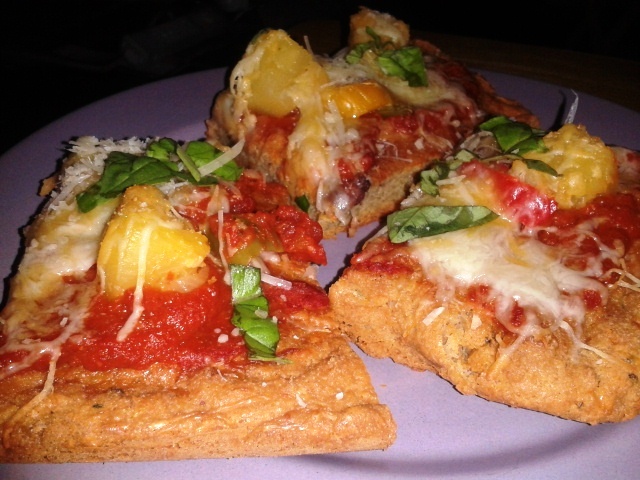 If you have some recipes on your blog that are gluten free that counts! 🙂 Many recipes are naturally gluten free.